Saudi Arabia is a country of mystery: it’s not easy to visit as a tourist as tourist visas are rarely approved, non-Muslims can’t visit the holy sites like Mecca and Medina, and most workers live on special compounds. My friends who have lived there have told me that’s a weird life – you stay mostly on the work compounds, you can’t really travel many places, and it’s often suggested you don’t wander the streets alone, especially as a woman. NomadicMatt: Tell us about yourself. Ceil Tulloch: My name’s Ceil Tulloch and I’m 44 years old. I was born in Kingston, Jamaica and raised in New York City. I’ve been teaching ESL/EFL abroad for the past 11 years – first, in the Far East and more recently in the Middle East. Currently, I’m teaching at a university in north-western Saudi Arabia and have been in the Kingdom for a total of two years. I’m a global adventurer who has traveled to 41 countries, a travel blogger and also the author of the nonfiction book, Remembering Peter Tosh (2013). What is life like as a foreigner in the country? Sum it up as best as possible! First, it’s conservative and provincial. This is the first country that I’ve resided in where the genders are segregated so severely and there are numerous restrictions on mobility. Since I’m accustomed to interacting and socializing with males, plus coming and going as I please, it was initially difficult coming to terms with the policy of not associating with men who aren’t relatives in public, the separate entrances to public establishments for males and females, or being denied total access to a facility due to my being female. Second, it’s quiet and secluded. Due to there being no social venues (amusement parks, clubs, movie theaters, bars, public swimming pools, etc.) in the Kingdom, socializing is confined to the compound. So, unless somebody decides to throw a party, or extend a dinner invitation, life’s very quiet here. Third, it’s diverse. The expat population is approximately 20% of the total Saudi population; therefore, foreigners have the chance to meet people from the four corners of the earth right here. That’s pretty special. Interesting. How did you end up teaching there?? Quite by accident. Although my master’s degree is in Education and my BA in English Literature, I never wanted to teach. While working as an admin at a firm in Manhattan, I saw an ad for becoming TESOL certified and decided to contact the Director of the Institute. He spoke so enthusiastically about his personal experiences of teaching ESL for a decade in South America, I decided to enroll in the course. The instructor was excellent and after I’d completed the program, I decided to go to South Korea and teach there for two years. I had so much fun I ended up staying for seven years. 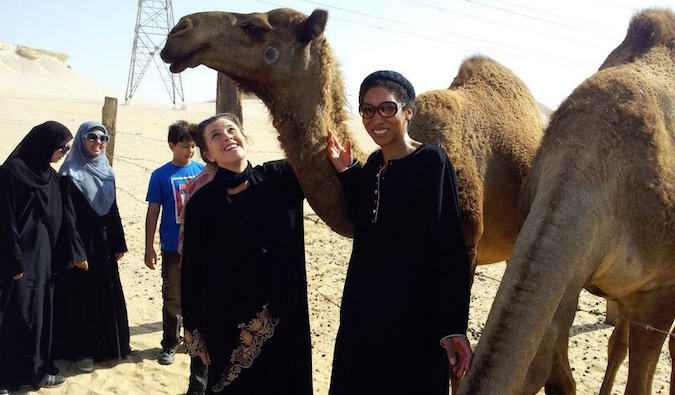 The opportunity then arose to teach in Saudi Arabia – and I was curious about life in the Middle East – so I accepted the contract. Afterward, I worked in the Sultanate of Oman for two years. Now, I’m been back in Saudi Arabia for one final contract. What kind of work do you do in the Kingdom? Since relocating to the Middle East, I’ve been teaching students at the collegiate level in what’s called the Preparatory Year Program (PYP). The English language PYP is a prerequisite for students prior to them being able to study their major. Its aim is to provide students with the rudiments of the four English language skills that will enable them to express themselves in English at the Freshman level. Is it easy to find work as a teacher in Saudi Arabia? What is the process like? Understandably, retention is problematic here, so there are many teaching opportunities available in the Kingdom throughout the year – especially for males. The minimum credential required for native teachers here is a Bachelor’s degree. The preferred disciplines are: English, TESOL, or Applied Linguistics. Additionally, two or three references are usually required. If a candidate wants to teach at a secondary or an International school, a teaching license from his/her home country is mandatory. Applicants for university positions almost invariably need a Master’s degree or higher in one of the aforementioned subjects, plus a CELTA or TESL certificate with over 100 hours. Naturally, having prior teaching experience in the region is advantageous. Currently, the age limit for teachers here is 60 years old. The Kingdom doesn’t accept online degrees either. Upon arrival into the Kingdom, the employer will request a notarized and authenticated copy of your university degrees, two color photos, and your passport in order to apply for your resident permit/work visa which is known as the iqama. It took me two months to get my iqama, but can take several months. Once an expat has an iqama, s/he is now able to conduct business transactions such as banking, getting phone service and internet, and mailing packages at the post office. Due to the recent economic crisis and drop in oil prices, it’s becoming more challenging to find plum teaching positions here. In the past, I could pick and choose from several offers, but this last time, I only received one and the package offered wasn’t as lucrative as it was four years ago. My friends at other universities across the Kingdom have also shared similar experiences. They’re being offered less attractive packages and if they want to renew their contracts, are being asked to take a cut in salary. Why did you take the job in Saudi Arabia? To be quite frank, I wanted to do some more traveling in the Middle East and Africa. Saudi Arabia is the perfect location for me to achieve my goals because I can also save the most money here. As a woman, how do you feel working and living in Saudi Arabia? It must be quite a different experience. It’s been quite challenging being an expat here. As you already know, females aren’t allowed to drive or cycle in the Kingdom and many places such as parks, gyms, and eateries are off-limits to us. Plus, once I’m outdoors, I must wear the abaya – which is rather encumbering. So, being a very independent and liberal person, it took me a while to adjust to the Saudi lifestyle. In terms of teaching here, it’s a bit frustrating because education isn’t really valued and most students aren’t interested in learning. They basically come to school because their monarch gives them a monthly stipend (approx. $265 USD) to attend an institution of higher learning. Additionally, due to the culture, fun learning activities with music and film that can be implemented in the classrooms in places such as South Korea are prohibited here. So, the teaching experience for me hasn’t been as rewarding as it was in other places. What advice do you have for people who want to live and work in Saudi Arabia? Are there other jobs open to foreigners there – or is it mainly teaching positions? I’d recommend that people who desire to come to the Kingdom do a bit of research on the culture to ensure that this is the right place for them. If they opt to come, they must remember that the only thing that matters here is Sharia law… To survive here, they’ll need to leave their Western moral sensibilities behind. Other employment opportunities in the Kingdom are in the fields of Energy, Health, Construction and domestic work, but tend to be restricted by nationality. I’ve noticed that the male engineers at the oil companies such as Aramco are from the USA, the UK, and South Africa. The doctors and pharmacists are predominantly Egyptian, the nurses are females from the Philippines… The laborers/construction workers are primarily from India and Pakistan; while the housekeepers hail from Africa and Indonesia. How does one get a job teaching if you aren’t in Saudi Arabia? The best way to job hunt here is by networking. If you don’t have any contacts, the next best option is to use websites such as Dave’s ESL Cafe and Serious Teachers. They were very helpful when I was job hunting. Going through a recruiter is also an option since many institutions here seem to be leaning more towards the third-party method instead of the traditional direct-hire method. Once you’ve been offered a contract, you’ll have to return to your homeland in order to start the application process that I mentioned earlier. The length of contract – I prefer one instead of two-year contracts because if it isn’t working for me, having a commitment for more than a year will be very painful. The promptness in paying salary – There have been many horror stories of institutions here not paying teachers on time or in full. So, I want to ensure that isn’t an issue at the university I elect to work. The standard of accommodation – I like to see photos of the compound / hotel where I’ll be residing. I’ve been lucky to have decent housing, but other teachers haven’t been as fortunate. Some live in decrepit spaces and have to share rooms. Why do you think teaching is a good option for people looking to live abroad? I believe that teaching overseas is an excellent way for people to immerse themselves in a new culture, plus hone their teaching and communication skills. Since there are numerous teaching positions around the globe, this is a wonderful employment opportunity for people who enjoy traveling and want to stay in a particular country for several months or years. Most teaching contracts offer generous vacation/leave days during the school year and summer break, which is ideal for teachers to indulge their wanderlust. For someone looking to live and work in Saudi Arabia (in general, not specific to teaching), what are three pieces of advice you would give them? Bring as much Saudi currency (riyals) as possible with you to tide you over until you receive your first paycheck. Depending upon your arrival date and the employer’s policy regarding payment, an expat might have to wait a couple of months before receiving his/her first wages. Expats need to understand that contracts here aren’t as binding as they are back in the West. Sometimes benefits that are initially promised don’t materialize. For example, relocation allowances and bonuses. A positive attitude and sense of humor are essential for enjoying your experiences in Saudi Arabia. 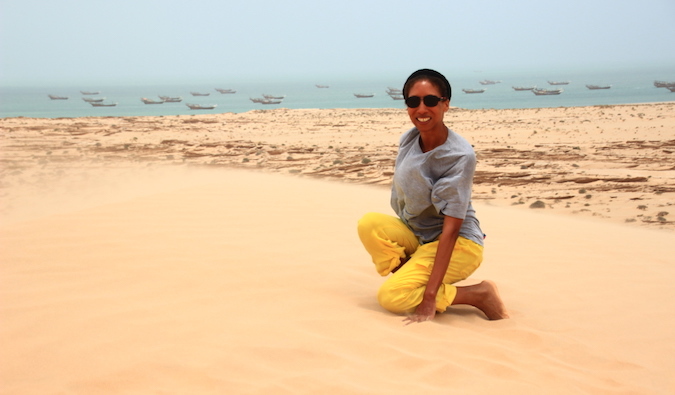 If you want to read more about life in Saudi Arabia, check out Ceil’s travel blog. We all come from different places, but we all have one thing in common: we all want to travel more.